No one is exactly sure who invented thumb wrestling. According to Wikipedia, Julian Koenig — the advertising copywriter who helped coin the slogan “It takes a licking and keeps on ticking” for Timex — claimed to have invented the game in 1936 while at summer camp. Meanwhile, author Paul Davidson says that his grandfather was the one who invented thumb wrestling, at some point in the 1940s. 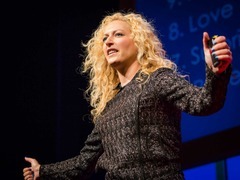 Jane McGonigal: Massively multi-player… thumb-wrestling? Whatever its origin, in today’s talk, Jane McGonigal (watch her previous talks Gaming can make a better world and The game that can give you 10 extra years of life) takes thumb wrestling in a new direction, making the classic two-person game into a massively multiplayer affair. She asks the entire TED University auditorium to stand up, hook hands and play — to hilarious end. McGonigal isn’t the only one out there remixing the game of thumb wrestling. On the TED University stage, McGonigal gives a shout-out to the artist collective Monochrom, who pioneered massively multiplayer thumb wrestling in 2004. On their website, they share the basics for how to create a game between 3 or 4 players, hooking hands in a star formation. They also created several architectures for assembling an even bigger game—from the “Big Gang,” where a dozen people form a circle and lock hands in the center, to the “Chain,” where traditional two-player games are interlocked, to the “Down Under,” where players bend over and play between their legs. A demonstration of Monochrom’s “Big Gang” formation. Want your thumb wrestling game to feel a little more official? Well, then you need a professional thumb wrestling ring. These colorful gadgets feature a platform with two holes, and ropes of course, for serious thumb wrestlers to use as they duel. Referee not included. The professional thumb wrestling ring does exist. The next step up: Thumb Wrestling Federation. This television show aired on the Cartoon Network in the United States and is also big in the United Kingdom. A send-up of the over-the-top spectacle that is the WWE, the Thumb Wrestling Federation tells the tale of two rival thumb wrestling gangs, complete with masks, sneaky tricks and commentators who are, of course, also thumbs. Wrestlers go by names like Vini Vidi Victory, Mr. Extremo and Wasabi. And of course, competitive thumb wrestling is a thing. The World Thumb Wrestling Championships are held each year in the town of Lowestoft in the UK. The 2013 champions: Dayna “Big Digit” Hunt and James “Tigermonkey” Isaacs. The organization is in talks to have next year’s championship televised. Meanwhile, the 826 Valencia Foundation (watch Dave Eggers’ TED Talk about it) also holds a regular thumb wrestling competition. Oscar Villalon, former San Francisco Chronicle books editor, once won three years in a row and wrote the book The Way of the Thumb about the experience. The reigning World Thumb Wrestling Champion: James “Tigermonkey” Isaacs. For the Star Wars fans among us, there is a way to use The Force against your thumb nemeses: this Lightsaber Thumb Wrestling Kit. It not only comes with finger-sized sabers, but with a book of background scenes. The Star Wars thumb wrestling set. And when you get bored of thumb wrestling altogether, perhaps it will be time to move on to … toe wrestling.